Leeds United boss Paul Heckingbottom admitted his Leeds United side were outclassed by long-time Sky Bet Championship leaders Wolves at Elland Road. The Midlands side went away with a 3-0 win to end their three-match run without a victory while for Leeds it is now one win in 13 and their head coach knows he faces a huge task to turn things round. He said: “It’s an indication of where we are. “If you want to be a team competing for the top six, we are short. “It was disappointing that they scored two goals from set plays and one from a long ball over the top. “They created chances, which we knew they would as they’re a good side, but they didn’t score from them. On Bailey Peacock-Farrell, who was chosen in goal in place of the dropped Felix Wiedwald, he said: “Thrown in at the deep end at the top of the league. Against a team likely to create chances. He can be pleased with himself. “I thought it was time to make a change. I felt I needed to make the team stronger. Wolves took time to establish their control with Leeds trying their best to play a pressing game as their head coach had wanted. But the first warning of what was to come was in the 19th minute as Ivan Cavaleiro was played in and produced a strong shot only for young keeper Peacock-Farrell to make a fine save and thereby quickly justify the decision to start him ahead of Wiedwald. A minute later Diogo Jota fluffed a great chance when miskicking close to goal after looking certain to score as he met Matt Doherty’s low cross from the right. Leo Bonatini then volleyed over with the ball coming off his knee from a Barry Douglas free-kick before Peacock-Farrell made another good save, coming off his line quickly to block an effort from Jota after the ball had broken well for him following Bonatini’s blocked shot. It looked like a goal would come and it did on 28 minutes when Romain Saiss was left unmarked from Douglas’s corner to head home. 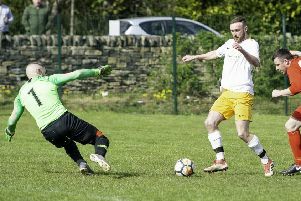 Things got worse for the home side as they lost skipper Liam Cooper to injury and his replacement, Matthew Pennington, took his time to settle. Wolves looked to score again when Bonatini went through from a great move that opened up the home defence, but Peacock-Farrell came to the Whites’ rescue again with a great one-on-one save. United finally managed a shot when Stuart Dallas’s effort from 25 yards was blocked, but the action was soon back at the other end with Willy Boly firing wide from a near post corner. Another corner produced a second Wolves goal just before half-time as Danny Batth’s initial header hit the crossbar and with no home players reacting Boly was able to head the rebound into the net. Leeds did manage a shot on target in the last seconds of the half, Pierre-Michel Lasogga’s speculative long range volley being easily saved by John Ruddy, but they were comfortably outplayed up to the break. The Whites did improve in the second half, but rarely threatened a comeback, although Gaetano Berardi, who was handed the captain’s armband after Cooper went off, did go close with a well struck shot from distance. Vurnon Anita did well to clear after Bonatini met a near post corner before Dallas made contact with a right wing cross only for Ruddy to save easily. Jota was next to go close for the visitors with a powerful shot that hit the crossbar and Wolves made it 3-0 15 minutes from time when substitute Benik Afobe raced onto a long ball over the top and beat the onrushing Peacock-Farrell with a superb finish into the top corner of the net. Berardi sent a shot onto the roof of the net and Caleb Ekuban’s header was comfortably saved, but Wolves saw the game out well to claim their three points. Leeds: Peacock-Farrell, Berardi, Jansson, Cooper (Pennington 36), Anita, Dallas, Forshaw, Phillips, Saiz, Sacko (Hernandez 45), Lasogga (Ekuban 73). Wolves: Ruddy, Doherty, Batth, Coady, Boly, Douglas, N’Diaye, Saiss, Cavaleiro (Gibbs-White 86), Jota (Costa 76), Bonatini (Afobe 70).